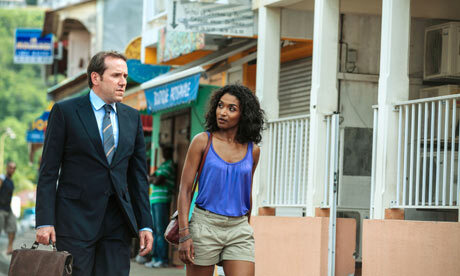 I first started watching Death in Paradise after reading the series description on Netflix. I was expecting a kind of crime sitcom show but it actually turned out to be a serious show filled with murder and deception. I watched the entire episode regardless and I was pleasantly surprised to find a well developed twist ending. Before I knew it, I had finished the entire first season and moved onto the next. The characters are likable and deliver strong performances in crucial scenes as the plots of each episode develop very smoothly. The series begins with British detective Richard Poole as he travels to Sainte Marie in the Caribbean to solve the murder of a fellow policeman. He is introduced to the local police force and investigates the body, interrogates suspects, and discovers clues as he progresses through the first episode. At the climax of the episode, it is revealed that the policewoman who worked alongside Detective Poole was actually the murderer all along. Until this point, I wasn't very impressed with the show so far but I did enjoy how they fooled the audience into thinking one of the characters would continue to be there throughout the series. After the first episode, I continued to the next episode and then throughout the first season. While some episodes did turn out to be suspenseful duds, others lead to shocking twists that didn't seem out of place or to unreasonable. There are charming consistencies and running jokes throughout the series that make it worth watching through each episode, although anyone trying to get into the show can pretty much start anywhere. The acting is good, the plot delivers most of the time, and the tropical environments and beaches definitely make this show worth trying out. I would recommend Death in Paradise to long time crime show fans and to people who are interested in getting into the genre. Overall, while it might not be on the same complex level as Criminal Minds or NCIS, but it is entertaining and definitely gripping at some points.